Did you see the Black Panther movie yet? If you didn’t, you may well be one of these ultra liberal, virtue signalling, politically correct idiots that thought that you might be stealing the fun, joy and seats from African-Americans that wanted to go to the cinema. Obviously, a grand diversity of people went to watch the film already due to the ever popular super hero theme, and the overall anticipation of seeing the Black Panther in action, which in of itself has already amassed record-breaking ticket sales over the President’s Day weekend. The film pulled in $316 million, earning $116 million over its $200 million budget already. Surely, a clever piece of business from Disney and Marvel right there. But as this tweet shows below, there’s a way to go for some people in racial equality and sense somehow, since the film is already being promoted as some sort of virtuous, stupendous moment in black history, almost bordering on being thought of creating a division or make us all feel guilty about colonialism. Wait, what? Let’s just take a look at this momentous and quasi derogatory tweet for a second. Surprise, surprise, it’s from one of those sorts of self hating white liberals that people need to be very concerned about. Wow! If this what you thought about before buying your cinema ticket in order to see the Black Panther, then you might have a problem, indeed. Anyway, let’s deviate from the ludicrous virtue signalling on race, and delve into our views on the film itself. On CNN, they keep reporting on this film as if it’s fact. We attempted to find the nation of Wakanda on the map, but we just couldn’t find it… The African nation that holds a vast abundance of the mineral Vibranium was nowhere to be found, and neither was the Vibranium. However, CNN reports on the cultural significance of this film, as if it’s something that people have never seen before. As we’ve said before, being a black super hero isn’t new! There have been countless other black super heroes, and even black super heroes in leading roles in films before. In actuality, it’s probably because Black Panther is the only African super hero, from a fictional African country, which is more technologically advanced than all the other countries in the whole world, that makes this whole thing culturally significant. Imagine that? Perhaps, if it wasn’t for the white colonialists (mostly Dutch and Portuguese) that came to the continent of Africa hundreds and hundreds of years ago to steal all the Vibranium, then Wakanda would probably be a reality right now… Or perhaps that’s just hogwash. Maybe if Africa didn’t willingly enslave their own people in the ruthless slave trade, which is now currently happening in Libya courtesy of Hillary Clinton and Barack Obama, then that wouldn’t have happened either. In our very own review of the film, we thought that the opening ten minutes where a little sleepy as we waited for the inciting incident to kick in… But the stylistic production design of the film soon took hold once T’Challa returned to Wakanda, but it really kicked off when we were introduced to the villains Klaue and Killmonger in that museum scene. Naturally in Wakanda, the vibrant colours, special effects, and the other many convincing performances of the film soon developed. Despite that many native Africans have already been complaining about the exaggerated accents, we think that the film was pretty much a solid home run in terms of Marvel super hero films. As a matter of fact, we reckon the film is probably the best Marvel film that has ever been put out… but it still doesn’t come anywhere close to topping The Dark Knight, unfortunately! However, achieving movie magic such as The Dark Knight, is a hard thing to beat. What made The Dark Knight so great, apart from the performance of Heath Ledger and the direction of Christopher Nolan? Well, it’s that the film practiced the suspension of disbelief, where you felt that you were actually watching something entirely real, since it didn’t go over board with too much action, nor did it showcase completely unbelievable fighting sequences, a thing that Marvel films always seem to do in their movies. Ryan Coogler, who directed Black Panther, obviously gave the studios what they wanted. The notion of “less is more” is not what Hollywood wants for some reason. 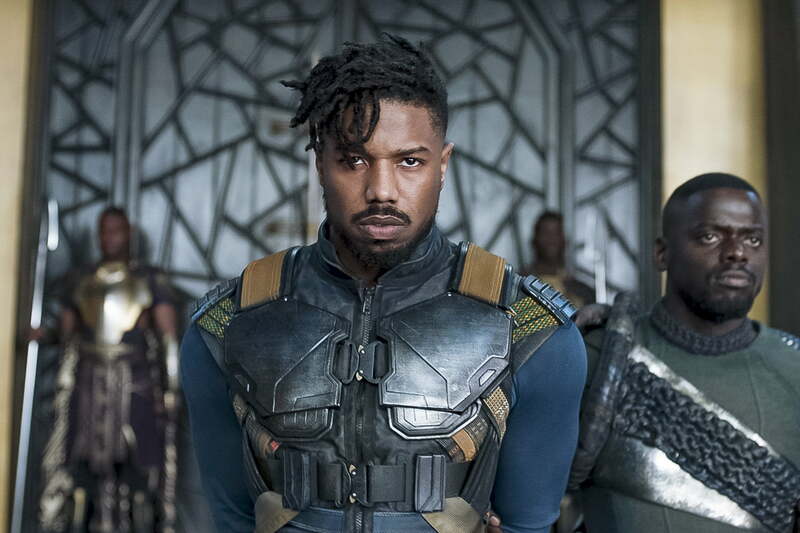 Some real standout performances came from Michael B. Jordan in his supporting role as Erik Killmonger, almost stealing the whole movie from under Chadwick Boseman, as he almost did to Wakanda at one point (sorry, spoiler alert), but Boseman represented the Black Panther very well, and surely now, given the mostly positive reviews (or you’re racist) and large ticket sales, there will most definitely be a sequel on the cards for him to do it all over again. Other standout performances in the film came from Andy Serkis, who played super villain Ulysses Klaue, who absolutely nailed the South African accent. Let that be a lesson to Leonardo Di Caprio who really struggled with it in ‘Blood Diamond‘. Andy Serkis was the epitome of a great villain, and added to the believability to the film when it was most needed, with some of the best scenes taking place in the London Museum location near the start of the movie alongside Jordan, as well as in the scene where Killmonger suddenly turns on Klaue. What a shocker! The best fighting scene would definitely have to be the South Korean casino sequence, where suspension of disbelief was upheld, and we could handle viewing all of the action at once, due to some clever special effects and camera work, which then later spills into the neon lit streets of Seoul with a car chase, but once again, after the novelty of the beautiful film noir night sequence wore off, the car chase was just way overdone as usual. Anyway, we don’t want to review the film to death, since many of you probably still haven’t had the chance to watch the film yourself, so as not to disrespect black people. Only joking! All in all, we pretty much enjoyed the film, and we would give it a healthy 70% out 100% on our Brainstain rating scale. If you enjoy films that take it over the top, then surely this film is a must see in cinemas for you! We’d definitely say it’s less over the top than other Marvel films, even if Wakanda at times has troubles keeping us focused in the realm of believability, unlike Gotham City.